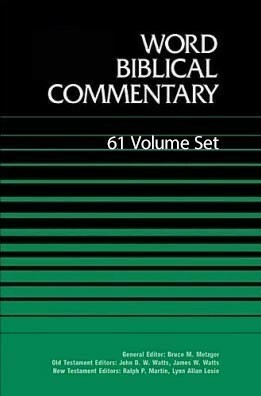 The Word Biblical Commentary (WBC) delivers the best in biblical scholarship, from the leading scholars of our day who share a commitment to Scripture as divine revelation. This series emphasizes a thorough analysis of textual, linguistic, structural, and theological evidence. The result is judicious and balanced insight into the meanings of the text in the framework of biblical theology. These widely acclaimed commentaries serve as exceptional resources for the professional theologian and instructor, the seminary or university student, the working minister, and everyone concerned with building theological understanding from a solid base of biblical scholarship. Volume 6a: Deuteronomy 1:1-21:9, 2nd ed. Volume 12: 1 Kings, 2nd ed. Volume 19: Psalms 1-50, rev. ed. Volume 21: Psalms 101-150, rev. ed. Volume 24: Isaiah 1-33, rev. ed. Volume 25: Isaiah 34-66, rev. ed. Volume 36: John, 2nd. ed. Volume 43: Philippians, rev. ed. Please note: Current set price only includes volumes available on Olive Tree.